Dr Leandro Pecchia, School Chair and IFMBE HTAD Chair, introduced tone fo the most used MCDA used in healthcare (i.e., AHP) and then presented a case study aiming to elicit user needs behind the use of ePipen medical device (i.e., auto-injector for severe allergy drug). 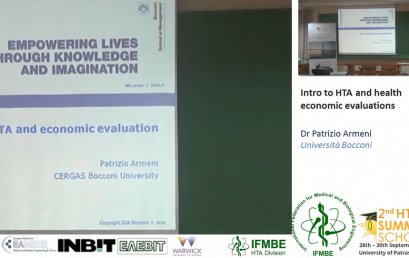 Dr Patrizio Armeni, Bocconi University, gave an introduction to Health Economic Evaluations, introduced the concept of Quality of life. 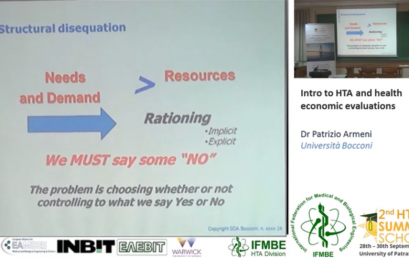 Dr Patrizio Armeni, Bocconi University, gave an introduction to the reasons why we need HTA, what are the economic constrained and the political reasons that influence health political decision-making. 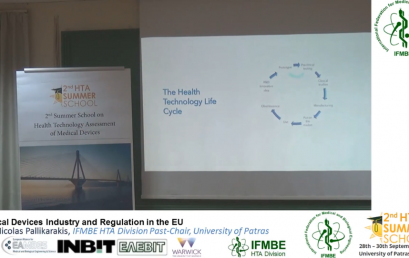 Dr Pecchia, School Chair and IFMBE HTAD Chair, introduced basic concepts of HTA, different types of health economic analyses, the concepts of cost-utility, willingness to pay, quality of life. 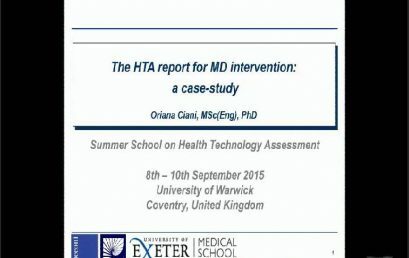 Finally, He discussed the main differences between medical devices and drugs and how this affects HTA. 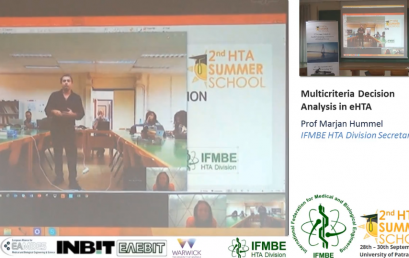 IFMBE HTAD Activities 2015-2017, Dr Leandro Pecchia -II IFMBE Summer School on HTA, Patras, Greece, 28-30.10. 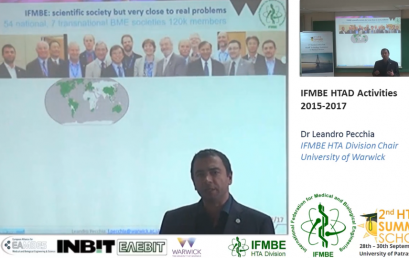 Dr Leandro Pecchia, School Chair and IFMBE HTAD Chair, gave an intro to the importance of the study designs and which study design we need in order to collect the evidence we are looking for. 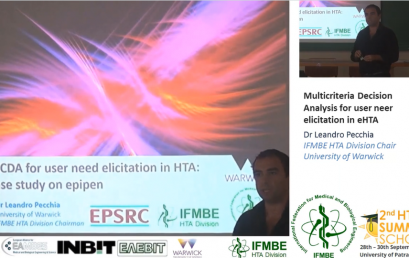 Dr Leandro Pecchia, School Chair and IFMBE HTAD Chair,introduced the topic of Meta-Analyses. 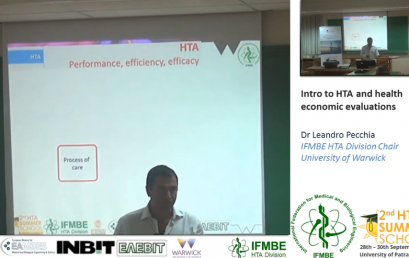 Dr Leandro Pecchia, School Chair and IFMBE HTAD Chair,introduced the topic of Meta-Analyses Early health economic evaluations, also called early HTA (eHTA). He introduced the headroom method and its application to enhance cost-effective medical device design. 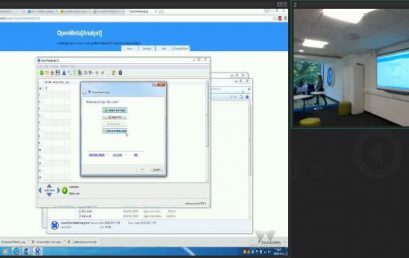 Finally a case study performed used the MAFEIP tool was presented. 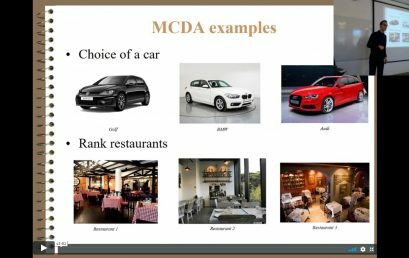 Dr Marjan Humme, IFMBE HTAD Secretary, gave an overview on how to use MCDA in eHTA. Prof. Nicolas Pallikarakis, School Chair, introduced the Medical device market and regulation in EU. 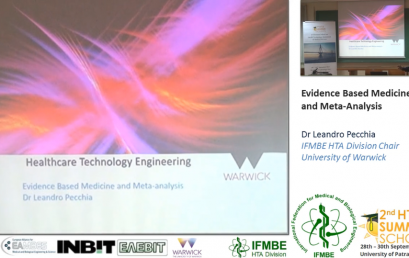 Prof. Tarricone discusses the peculiarities of the Medical Devices sector and relating challenges in the evaluation of these health technologies. 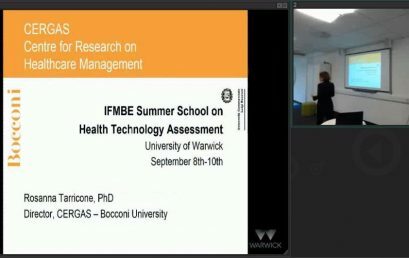 Prof. Tarricone is Associate Professor at the Dept of Public Management and Policy Analysis at Bocconi University (IT) and Director of CERGAS. 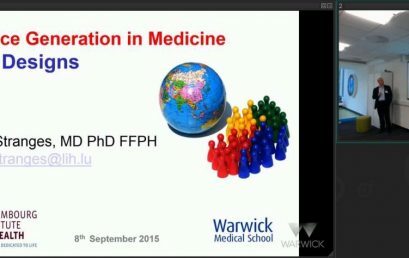 First IFMBE Summer School on HTA, University of Warwick, 8-10 September 2015. 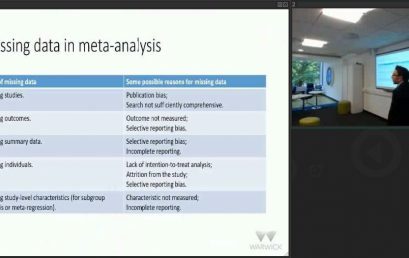 Dr Paolo Melillo, covered some advance topics relevant for meta-analysis, why it is needed and what are main advantages and limits. Dr Paolo Melillo, Second University of Naples, Naples, Italy. 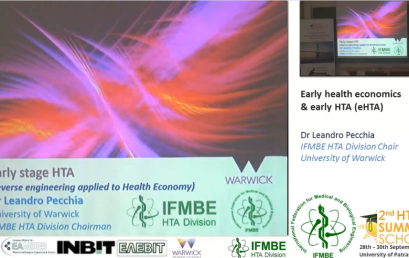 First IFMBE Summer School on HTA, University of Warwick, 8-10 September 2015. 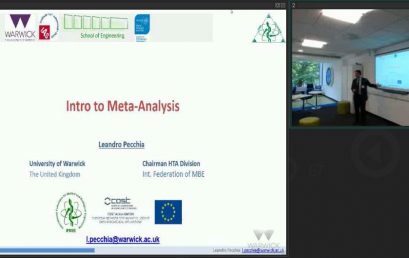 Dr Leandro Pecchia, introduces the aims and the goals of a meta-analysis, why it is needed and what are main advantages and limits. 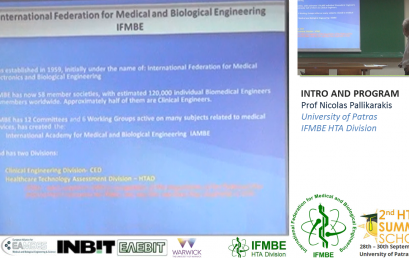 Dr Leandro Pecchia, University of Warwick, UK IFMBE HTAD Chairman. 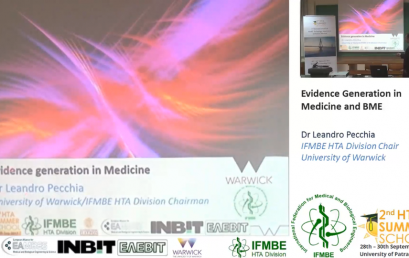 First IFMBE Summer School on HTA, University of Warwick, 8-10 September 2015. 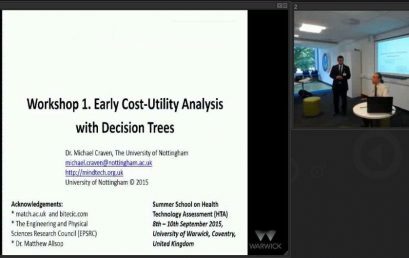 Dr Craven introduces the use of decision tree for premarket and early stage HTA, with particular focus on medical devices. Dr Michael Craven Senior Research Fellow, University of Nottingham, UK. 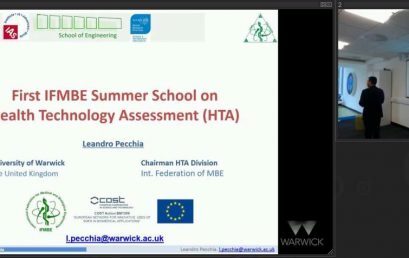 First IFMBE Summer School on HTA, University of Warwick, 8-10 September 2015.